This Myler bit is a stainless steel 3-Ring Combination bit with a sweet iron Low Port Comfort Snaffle copper inlay mouthpiece. This mouthpiece is made of polished Sweet Iron which naturally oxidizes or rusts. Harmless to horses, it has a sweet taste and promotes salivation. This type of Myler ported bit is good for horses in beginning stages of training and those needing some tongue relief. 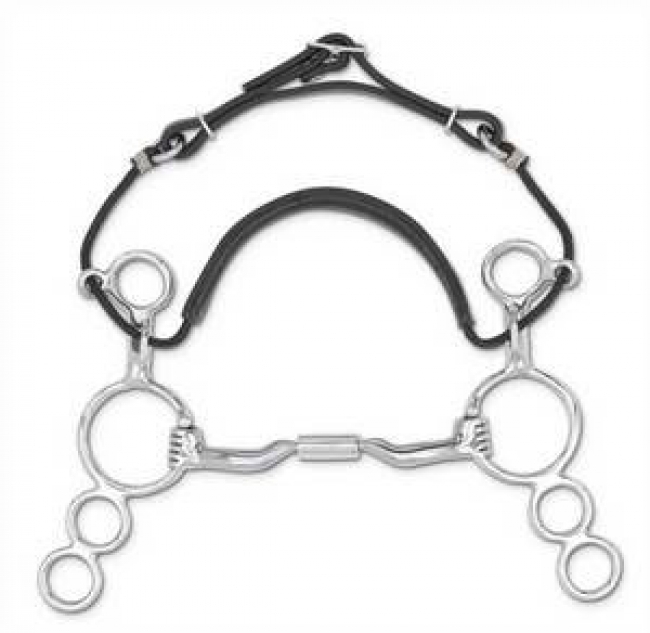 Bit Design: This Myler bit is a hybrid of a ring bit, shank bit and Hackamore. The design features a large center ring for mouthpiece attachment, a top ring for headstall attachment and a bottom ring for rein attachment. The bottom ring is directly attached to the center mouthpiece ring. The mouthpiece slides freely on the center ring until arrested by a “ring stop”. A rawhide-covered rope noseband and curb strap are linked together and run through two small offset rings on the purchase This particular mouthpiece is curved with a low-ported center barrel. 3/4" Port, 6" shank. The Myler 3-Ring combination bit automatically disperses or releases direct action and leverage pressures to the horse’s mouth, chin, nose and poll. Light pressure is applied to the mouth as the mouthpiece slides on the ring. After contacting the “ring stop,” the mouthpiece will engage completely and apply more downward pressure. Also, the backward and downward pressure of the noseband and the forward pressure of the curb strap are extremely effective at asking a horse to relax at the poll. Pressure on tongue and corners of the bars. Slight collapse on the bars. Used for both English and Western Disciplines. Sizes: 4 3/4", and 5"